If Marcos Mora wasn’t so busy serving as the coordinator for Omaha’s Cinco de Mayo celebration he’d have no problem around this time of year working musician. Coming from one of the oldest musical families in Omaha, la familia Barrientos, Mora has music in his blood. But instead of doing a concert for the city’s biggest Latino celebration, he’s booking them for others. “This is kind of all I do,” Mora says. “These months we just breathe and sleep Cinco de Mayo. I’ve probably had 50 requests to play that weekend. It’s kind of amazing how it has developed.” In the 26 years since South Omaha first started hosting its celebration of the Mexican army’s victory over the French in Puebla on May 5, 1862, the annual festival has grown to become an event that draws in people from all over the city regardless of their heritage. Mora, who has been working behind the scenes since 1997 as a volunteer and now as a coordinator, counts the broadening appeal of the Cinco de Mayo celebration as one of South Omaha’s great achievements. “There’s always a little bit of a stereotype with South O, but with Cinco de Mayo we’ve sort of broken that stereotype,” he says. “You see African American families, American families, businesspeople, educators and politicians down here now. It’s always been a little bit diverse, but that aspect just keeps growing.” This year’s celebration covers five days of family-friendly events kicking off with the Excellence in Education Celebration on May 4 at La Mesa Restaurant, 1405 Fort Crook Road South, in Bellevue. Longtime South Omaha educator and 2011 Grand Marshal Dr. Jim Ramirez will be the guest of honor at the fundraiser for the Mexican American Historical Society of the Midlands. The winner of the 2011 Miss Latina Omaha pageant will also be crowned at the event. On May 5 all five Grand Marshals along with the numerous sponsors making the Cinco de Mayo celebration a reality will be honored at a reception at the new Mexican Consulate Office, 7444 Farnam St. Friday brings the annual luncheon at Metropolitan Community College and will feature nationally-renowned speaker Carlos Ojeda, as well as music from Mora’s own Mariachi Luna y Sol. On Friday, the weekend truly gets going with a free concert from the chart-topping norteno band Grupo Control at La Plaza de La Raza, 25th and N. Billed as Los Reyes de Cumbia, Mora says he sought a national act to spice up what had in recent years been a slow night and he’s eager to see the reception from the community. “We haven’t had a national act in a while,” he says. “It will be interesting to see what sort of group we get. We figure we’ll have between 1,000 to 3,000 people at the concert.” The 26th annual parade, one of the biggest in the state, kicks off the Saturday slate at 10 a.m. and will travel down South Omaha’s historic 24th Street from B to O Streets. From there, the annual fiesta and carnival moves to La Plaza de La Raza on Saturday and Sunday featuring live music, local food and a number of games and contests. Based on feedback from previous years Mora said they worked to create a separate Mundo de Ninos on N Street featuring more rides and activities for younger children as well. Things get off to an early start at 7:30 a.m. Sunday with a 5k Run/Walk to benefit youth ministry group Ixim Spirit of Solidarity at South High School’s Collins Stadium, 22nd and M. An outdoor Mariachi Mass will be held at 10:30 a.m. featuring liturgical music performed by mariachi at the South Omaha Plaza, 24th and N. When Mora’s not busy putting together one of Omaha’s premiere celebrations he’s frequently on the road playing music throughout the region, an experience that’s given him a unique perspective on what Omaha’s been able to accomplish. “I go to a lot of cities and think to myself, ‘Man, our festival is bigger than this,’” he says. 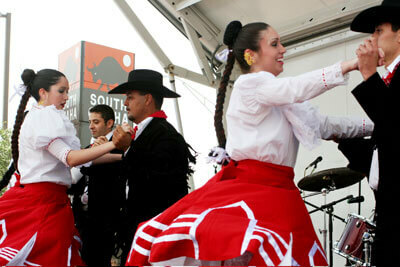 In regard to Latin festivals, it’s probably the biggest until you get to Chicago. It’s really grown and I think the city is beginning to notice the economic impact we can have.” The 26th annual Cinco de Mayo festivities take place May 4 through 8 in historic downtown South Omaha. For a complete listing of events or for more information visit cincodemayoomaha.com.